Will a eta 2824 fit in a 1570 case with a case ring? Is that what you would use as a replacement? That's a very nice watch by the way. I had this problem too with a build I did a while back. The movement is too tight against the dial causing the date wheel to bind. You have to remove the hands, dail and add the small spacer ring. It also could be that the case screws are too tight. 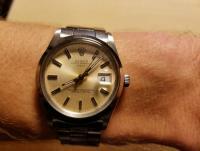 What to use with Rolex cal 3000 dimensions? I tried the oven method to age the hands but really didn't like the outcome. They are not perfect put I'm happy. Here is my first try at aging. Hello, I started this Tudor ranger build using all the design elements that I like. I wanted something in 34mm because its small and comfortable to wear. Gen Rolex 15000 case Yuki dial Eta 2824 clone Generic snowflake hands Yuki Bracelet Removing the cyclops from the crystal Disclaimer: I know that Tudor never made a red Ranger with snowflake hand...etc. This is interesting the had the same issue with a yuki 3135. I replaced the winding works with gen parts, but I don't think you can do that with the SA3135 Is the SA3135 a decorated eta2836? I really like the look. A bonus would be the new blackbay gmt on a jubilee. Blackbay Mods, What Do You Think? I wanted to do a blackbay GMT mod. Will a eta 2836 fit in a 1575 or 1570 case? Looks awesome. Where do you buy a Vietnam case? I'm looking to do a 1675 build.